DETROIT – Clergy members are warning that problems vexing Detroit’s water system – aging pipes, service interruptions, rising bills and widespread shutoffs – are coming soon to a Michigan town near you. Gathering as downtown Detroit was under a boil water advisory because of a main break, religious leaders and academics on Monday released a 100-page report that calls for reinvestment and reform to Detroit’s system. “The water crisis is a rolling crisis that will affect the entire country and indeed the entire world,” said John Powell, director of the Haas Institute for a Fair and Inclusive Society at the University of California Berkeley that authored the report. “If we don’t fix infrastructure, it won’t just be Flint, Detroit or Pontiac. It will be the entire country,” he said at an event unveiling the report at Metropolitan United Methodist Church in Detroit. A struggling mom. A boy and dead goldfish. A Detroit shutoff story. Is Detroit finally turning the corner? 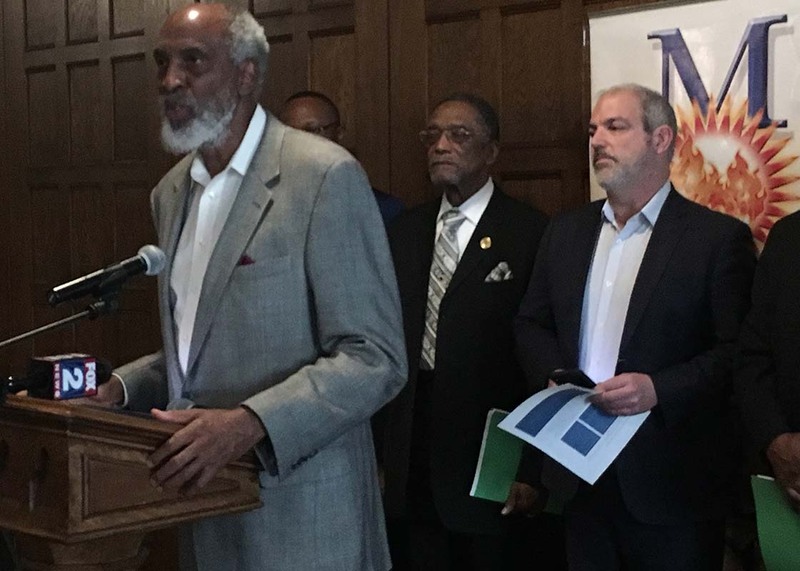 The report was released in conjunction with a faith-based group, Detroit Metropolitan Organizing Strategy Enabling Strength (known as MOSES) and funded by the Kresge Institute. The report makes the case that century-old infrastructure and delayed maintenance are first affecting impoverished, minority communities such as Detroit and Flint and leading to what activists call “water instability” – difficulty paying bills because of rising rates. “Everything we recommend is going to cost money, but the problem is not going to go away,” said Joseph Recchie, a report author and founder of Praxis Partners, a Columbus, Ohio-based company. It’s a similar warning that Michigan officials have sounded for years, as a task force appointed by former Gov. Rick Snyder warned the state needs another $4 billion per year to maintain roads and other infrastructure. Among other things, the MOSES group is urging Detroit to renegotiate the 40-year lease of its water and sewer system to the Great Lakes Water Authority, which serves dozens of suburbs and 4 million residents. As part of the city’s bankruptcy, Detroit agreed to the 2014 deal in exchange for $50 million per year, but the report claims the system was never properly assessed and the city deserves far more money. Michelle Zdrodowski, chief public affairs officer of the authority, released a statement criticizing that conclusion, saying the deal was "extremely complex" and allowed Detroit to avoid selling the system and transfer "several billion dollars of debt obligations" to the authority. The report's authors did not attempt to contact the authority to "get an understanding of its formation or the parameters of its operations," Zdrodowski said. A moratorium on water shutoffs that have disconnected more than 100,000 residential accounts in Detroit since 2014 until payment systems are overhauled. A switch to an income-based billing system that would cap rates at no more than 2-3 percent of residents’ income. Detroit officials have decried both proposals as wildly unrealistic, saying that income-based billing would raise rates for most customers and is forbidden by state law. The shutoffs have boosted collections rates to 91 percent this year from 77 percent in 2016, bringing in $56 million more per year for the city, according to city records. Detroit officials issued a statement pointing to assistance programs that have helped 10,000 households since 2016, and another 2,500 families with repairs that cut bills. “(Detroit) agrees more can be done to support water affordability and continually seeks additional funding for customer assistance programs through donations and grants,” the city’s water director, Gary Brown, said in a written statement. One thing activists and water officials agree on: There is a water crisis. Water affordability is fast becoming a huge issue. Since 2010, average rates nationwide have climbed to $70 per month from $44 for a family using 100 gallons of water per day, according to surveys from Circle of Blue, a Traverse City-based website that covers water issues. Rates are soaring because water and sewer systems are old – 100 years or so on average – and usage is declining because of conservation efforts and efficiencies. Costs increasingly are being born by local systems: Federal grants have dropped 77 percent in real dollars since their peak in 1977, according to Food and Water Watch, a Washington D.C. nonprofit. As a result, 12 percent of households nationwide now pay more than 4.5 percent of their monthly income on water and sewer bills – a rate the Environmental Protection Agency deems unaffordable, according to a 2017 study from Michigan State University. In five years, more than 1 in 3 households won’t be able to afford water if trends continue, the study concluded. A separate study from the University of Michigan last year found that Metro Detroit residents paid 10 percent of their incomes on water each month. “The water issue does not stop at 8 Mile Road,” the Rev. Charles S. G. Boayue, superintendent of the Detroit Renaissance District of The United Methodist Church, said Monday. Detroit shut water to more than 11,000 homes in 2018, a dramatic decrease from more than 33,000 in 2014. Here’s a look at where shutoffs occurred. Scrambling for money, water systems are turning to aggressive collections. Detroit ramped up water shutoffs in 2014, and has since disconnected 112,000 customers who were 60 days or $150 past due, according to city records obtained by Bridge Magazine. The city didn’t release records on service restoration until this year, and they showed about 1 in 10 customers remained without water months after shutoffs. Nationwide, an estimated 15 million people in 2016 experienced a water shutoff in 2016, according to a report last year by Food and Water Watch, a Washington D.C. nonprofit. That year, Detroit ranked ninth nationwide in shutoffs with about 26,000, trailing predominantly southern cities such as Oklahoma City and Tulsa. Other large Michigan systems, including Lansing and Grand Rapids, have not made shutoff data public. I find stories like this amusing simply because of those groups promoting them constantly trying to convince people that the failed philosophy of "From each according to their ability to each according to their need" failed (repeatedly) simply because it wasn't tried the right way (multiple times) before and that THIS time things will be different simply because they presented it differently. Try changing the item in question and see how well that works out. Try walking into a nice restaurant and demand that your bill should be lower, despite getting the same food as those at the table next to you, and that the next table should pay more. Try walking into a retail store and demand that the cashier ring up your clothing purchase at a lower price and that the person in the next checkout lane should pay more. Try walking into a realtor's office and demand that the price on a house that you like should be lower, despite getting the same square footage, amenities along with zip code as another house and that the people buying that house should simply pay more. Try walking into a car showroom and demand that a new car price should be lower for you, despite getting the same make, model & options as those at the next salesman's desk, and that the people sitting there should pay more. You won't, because their ideas simply don't work. Something that the Haas Institute & MOSES obviously haven't figured out for themselves yet. What Bones?? This was a total failure of your beloved public sector ( and an extreme left one at that), markets had nothing to do with it. So now you ask how the market will solve the PS mess? I can not fathom how a privately run water system could do worse than Detroit Public Water. You can't think of how a private monopoly over a life sustaining resource would be a bad thing? I don't know about you but during the winter I consider natural gas a life sustaining resource. Unless I missed it I don't remember the MI tax payers having to bail the gas company out for hundreds of millions of dollars either. May be a shock (to you) most if not all providers of "life sustaining" necessities seem to run fairly well without being socialized. You must live on a Kibbutz? Government is not the evil that you portray it to be. Get Real! Compassion is not all about nursing your sense of white superiority, and what you choose to feed your "charitable vibe". You characterize my comments as Marxian. There is a huge middle-ground between Marxism and the excesses of your kind of Ayn Rand individualism. Fortunately, most Real Americans fall well in their sentiments within that middle ground. That's why we have at the federal level a graduated income tax, which also includes a modest income transfer. That's why our Michigan Income Tax does likewise. It's why much of the burdens of local government are financed by a property value tax, rather than a straight fee for services. This water inequity report falls dead center within what most Michiganders actually and fortunately believe. We need to look after what best serves the best public interest. I recognize that the editors of this comment may be concerned that it goes too much over the top. And I can live with that. I see that it didn't take that long for you to play the racism card. Just what evidence do you have back up THAT claim Mr. Washburn? Hopefully, more than the number of examples you've been able to provide so far of working examples for the philosophy you espouse? And if that philosophy is as popular as you claim , then why are the democrats so hell-bent on muzzling AOC & why did they deep-six Bernie's presidential ambitions? My compliments to Joel Kurth for doing his own broader research and placing the Haas Report in a broad context, consistent with many other findings. I would differ with the previous commentator. Water is not just another common consumer commodity like an auto, box of cereal, or meal in a restaurant. Potable water is and has always been a major key with regard to public health and the common good. I grew up on a farm with no running water. Under those circumstances, an outhouse is a workable means of disposing of human waste. But that is intolerable to public health within the close confines of an urban area. Flies breed in it, and spread its bacteria wide and far. Playing loose with public health is a high risk to us all, higher than everyday statistics may indicate. The Flu Pandemic of 1918 should be kept in mind. Antibiotics are becoming less and less effective. Many common diseases are making a comeback. Medical care is getting more and more expensive and unaffordable for many. Thanks, Ben! I appreciate it. No problem Joel. I was there for the press conference. Among other things, I've been the Treasurer for MOSES for the past 5 years. I think that mosques, synagogues, and churches are institutions which are focused in upon matters which truly address the common good. And a deep concern about the common good characterized the writings of those folks who championed our nation, totally unlike those who these days champion an agenda of every dog for himself. I think that you asked good and pointed questions, and that you placed the Haas Report in a broader and publicly useful context. That is why I make a $50 monthly contribution to Bridge Magazine. Keep on doing what is in the best public interest, whether or not I may personally disagree with you on this or that. We appreciate your support, Ben! I would disagree with that assessment, Mr. Washburn. Those examples I had included are not common consumer quantities, they are all basic needs. Like all basic needs in our society today, they are currently acquired based either upon your ability to pay or through the charity of others. And just so that we are clear, charity does not mean using the power of government to take from others and give to people who have made poor decisions with their lives. You make my point with your analogy regarding health care. Americans were told that Obamacare would mean that health care would be affordable to all. We've all seen the results of what "spreading the cost" has done to that model. Higher premiums and higher deductibles. Why make the same mistake again by giving this report's recommendations any credibility? Fixed costs spread to a dwindling population = disastrous prices. Detroit's infrastructure once served 2 million residents, most of whom had good jobs and could pay their water/sewer bills. That infrastructure remains, aging and costly. The paying customers are fewer. Also, the system cannot lay off employees when water use declines. The plant must be staffed. Last, the pricing system is archaic. DTE energy charges the same rates to all its customers, spreading costs to city and suburb alike. In southeast Michigan, each local government sets its own rates, based on its costs and its population. That's not working to ensure safe water supply to all. Problem identified. Those two million customers that used to pay the bills only paid part of the bill. Left out was the inevitable cost of replacing the system down the road, that is, they kicked the can to today’s customers. Worse yet half the customers spread over same area and no willingness to make hard calls. I think that you were trying to make a supportive statement, but just like me, that is sometimes hard to make. But, yes. I came to Detroit in 1962 as a personnel examiner for the Detroit Civil Service Commission. I was hired specifically because of my past experience as a graduate of an agricultural vocational high school, and as a veteran of US Air Force technical intelligence efforts. I worked closely with the then head of the Water System on numerous issues. Actually, I know the operations of the water board from the ground-up. These days, some folks, mainly suburbanites seem to blame now-day Detroiters for public decisions made back between 1910 and 1950, and to be responsible for the costs of those decisions. But, in 1960, most of today's Detroiters, were descent from folks whose votes didn't count back then. Most of those folks who actually made those decisions, and their children and their grand-children have long since moved to the suburbs, and thus somehow, were magically dissolved of any liability for the decisions that their ancestors might have made way when back. Curiously, it just like those folks who have had a long line of ancestors who were slave-owners who seem to think that they have absolutely no responsibility for the current-day advantages to which they have fallen privilege because of that situation way back then. Gentlemen, as you debate the origins and historical causes of this crisis, know this: You, and I, and our parents (if they still live in the city) pay our bills. We pay our water bill. Many do not, and the water department's collection system has been dysfunctional and wholly ineffective for at least two decades. In a city where 47% of the population is below the poverty line (or pretending to be) and more than half of the customers are renters, freely running up the water bill and moving elsewhere to do the same...the current circumstance is, and has been for awhile, unsustainable. Those who pay resent, understandably, those who don't. And those who don't, with their new cars and iPhones and all the trappings of people who work for a living...game the broken system. And those who game the system have misguided advocates who...help to perpetuate the snowball rolling down the hill. Hello, just popping in to say that Professor powell does not capitalize his first or last name.